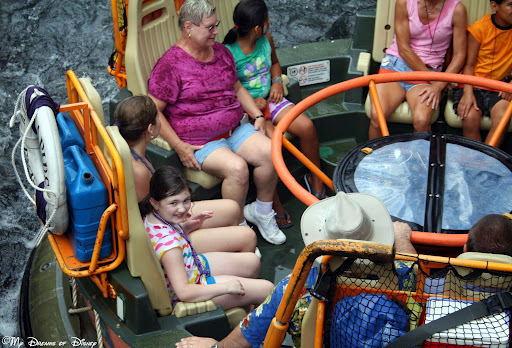 30 Things To Do At Disney World: Kali River Rapids! When it comes to one of the best ways to cool off during a really hot summer day, I have a hard time finding anything that compares to Kali River Rapids, located in the Asia Pavilion of Disney’s Animal Kingdom! This water raft ride — which has an incredibly detailed backstory, I might add — is, without a doubt, the one ride that will get you drenched with water! Splash Mountain, despite the name, doesn’t hold a candle to the water drenching that you are likely to receive when you ride Kali River Rapids. I love taking trips down the Chakranadi River, and in true Disney fashion, the Imagineers have done an incredible job telling the real story of this attraction — how the logging companies have been endangering acres and acres of rainforest in locations across the world. It is a somber note, but an important one, one that draws attention to the fact that Disney’s Animal Kingdom is more then a theme park with great rides — it’s also a powerful force for conservation across the globe through it’s outreach programs. Still, the primary focus for many of us that ride Kali River Rapids is not just to remember the rainforests, and I’d be lying if I tried to tell you otherwise. The main reason I ride Kali River Rapids is to enjoy a fun raft ride and get drenched in the process! That is why it is one of the 30 things that I have to do at Disney World! Take a look at these photos, and tell me if you agree! A little bit of water at the end of the ride. Watch out for the elephant on the left – he shoots water! Kali River Rapids – 44 Days Until Disney! Previous Post: 30 Things To Do At Disney World: Eat a Mickey’s Premium Ice Cream Bar! Next Post: Disney in Pictures — Treasures of the Magic Kingdom!